On a cold bright morning Wily was out shoveling show after a recent winter storm. He had just finished throwing the last shovel full onto the side of his driveway when his neighbor stopped by. After a few words about the nasty weather, the neighbor asks Wily if he knew anything about fireplaces. Being the only technical person in the neighborhood, Wily often got unusual questions about this and that. Wily asked the neighbor if he was having problems with his fireplace. The neighbor said that he indeed had a problem. His gas fireplace would not turn always turn on. Some days it did and some days it didn’t. The pilot light was always on. Wily asked him if he turned off the pilot light during the warmer months each year. The neighbor said that he had not touch the gas valve in the 10 years he had lived in the subdivision. Wily said he thought he knew the reason for the fireplace problems and said he had a simple solution. Since all the fireplaces in Wily’s neighborhood had the same kind of fireplace, Wily was familiar with the device. 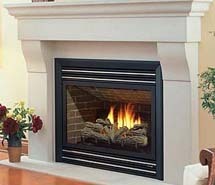 As illustrated below, a typical gas fireplace has a small pilot light flame. The flame heats up a metal tube, which contains 100s of tiny thermocouples. When heated, the “thermopile” device generates a voltage of about ½ volt. 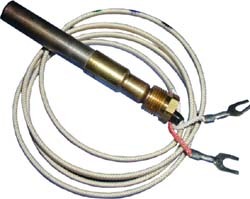 The thermopile is connected to the main gas valve, through a toggle switch on the wall. Closing the switch routes current from the thermopile to the gas valve and controls the gas flow into the fireplace. With the gas turned on, the flame from the pilot light ignites the gas. If there wasn’t enough voltage coming from the thermopile, the valve would not open. This was a very important safety feature, which prevents the gas from turning on if there was not a pilot light. But, over time, if the pilot light was left on year after year, the output current from the thermopile would degrade to a point where it would no longer produce enough current to turn on the valve. So, what is the solution? The long term solution would be to replace the thermopile. But, in the short term, Wily knew a way to keep the thing going for another year or two. The fireplace was working, but not all the time. It needed just a little help. Wily knew that it takes more current to turn on the gas valve than to hold the valve open. What was needed was a way to provide the peak current needed to open the valve. Once open, the thermopile should be able to produce enough juice to keep it open. Relays, solenoids and other electromechanical devices all had this characteristic. 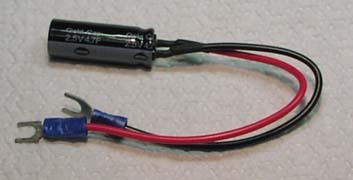 As shown below, the solution was to connect a supercapacitor across the thermopile. This device acts like a battery and would provide the needed peak current to open the valve. Wily figured that a 4.7 farad device would be big enough. He knew he had a few of these devices in his lab inventory. Wily told his neighbor that he would fix the problem for a good cup of coffee and one of his neighbor’s famous sweet rolls. Wily went into his basement and quickly found a suitable capacitor. He soldered some wires onto the part, wrapped some electrical tape around the thing and then headed over to the neighbor’s house. Within a few minutes, the part was wired into the fireplace and with a quick flick of the fireplace switch, verified that it was doing its job. Wily and his neighbor drank of cup of coffee and a sweet roll while discussing the possibility of more snow in the forecast.